Complex in appearance, this fly is actually quite easy to tie, according to fly swapper Bob VanAmburg. For warm-water and bass anglers, it's very effective. 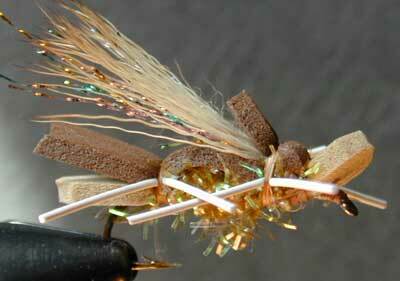 The fourth featured fly of our fourth fly swap, which was sponsored by Tim at Yagers Flys is from Bob VanAmburg. "This is a fly that I watched Jack Dennis tie at a local Sportmans Show. It isn't as difficult to tie as it sounds, although there are a lot of separate steps. According to Jack Dennis, it won the Jackson Hole one-fly contests the past two years in a row," says Bob. Tying steps: 1. Prepare the foam by cutting it into approximately 1/8" strips. Roughly round of one end of the tan foam, and cut a "v" shaped notch into one end of the brown foam. 2. Lay down a good base of thread. Some head cement on the thread at this point will help keep the foam from spinning on the hook shank. (Compressing the thread requires a little bit of pressure on the thread, so you might be more comfortable moving to a 3/0 thread). 3. Tie in the tan foam. The rounded end should extend slightly past the bend of the hook. Tie it forward, leaving room at the front for the head. Cut off the foam and shape the front into a roughly circular shape. The foam is easiest to tie in if you do it loosely, followed by a series of tighter wraps. 4. Tie in the Estaz between the two circular ends. Bring the thread back to the rear of the fly by counterwrapping through the Estaz wraps. 5. Tie in the brown foam overbody, using a single series of wraps at the tail end of the fly, so that the notched end extends slightly past the rounded tan foam tail. 6. Tie in the rubber hackle legs into the notch between the tan and brown foam bodies, so that they appear to form an "x" shape. 7. Wrap the thread through the Estaz portion of the body so that it ends up immediately behind the beginning of the round tan foam head. Bring the brown overbody down to this point, as though you were tying a Humpy, and tie it off, leaving the free end to extend to the front of the fly. 8. Tie in the underwing consisting of several strands of Krystal flash, over which tie the elk hair wing. Keep it fairly sparse. 9. Bring the Brown foam back over the wing and tie it off, letting the free end extend back over the wing. 10. Tie in the forward rubber hackle legs, again forming an "x" shape. 11. Wrap the head and whip finish. Turn the fly over in the vise and apply head cement not only to the head, but also to the wrappings behind the head on the bottom of the fly. 12. Trim the brown foam into a rounded shape over the front of the wing. Additional Notes: This is a fly that I watched Jack Dennis tie at a local Sportmans Show. It isn't as difficult to tie as it sounds, although there are a lot of separate steps. According to Jack Dennis, it won the Jackson Hole one-fly contests the past two years in a row. This fly appears to be complex but is really very simple to tie. The most difficult part is proportioning the foam, which can best be done through trial and error. Most tiers will grasp proportion very quickly. This fly is a passable stonefly imitation, but more importantly, represents a buggy looking, large juicy morsel that can also be fished as a grasshopper imitation or as a general purpose searching pattern. Because of its foam construction, it floats like a cork and is virtually unsinkable. As one might guess from its "One Fly" origins, it is extremely durable and can survive being fished all day, even on rough-mouthed warm water species. Since the swap, I have used it successfully in Washington, Wyoming, and Montana. I found this fly to be particularly effective on Smallmouth Bass in the Boundary Waters of Minnesota this spring and summer. In addition to the tan/brown original, when targeting Smallmouth I also tie it in black/orange and yellow/chartreuse.